Cell Cleaning (Day 1-2)Brood cells must be cleaned before the next use – cells will be inspected by the queen and if unsatisfactory will not be used. Worker bees in the cleaning phase will perform this cleaning. If the cells are not clean, the worker bee must do it again.Nurse bee (Day 3-11) Nurse bees feed the worker larvae worker jelly which is secreted from glands that produce royal jelly. Advanced Nurse Bees (Day 6-11) Feed royal jelly to the queen larva and drones receive worker jelly for 1 to 3 days at which time they are started on a diet of honey and pollen. Wax production (Day 12-17) Wax Bees – build cells from wax, repair old cells, and store nectar and pollen brought in by other workers. Early in the worker’s career she will exude wax from the space between several of her abdominal segments. Four sets of wax glands, situated inside the last four ventral segments of the abdomen, produce wax for comb construction. Worker activities d Honey sealing (Day18 – 22 ) Mature honey, sufficiently dried, is sealed tightly with wax to prevent absorption of moisture from the air by workers deputized to do same. Drone feeding Drones do not feed themselves; they are fed by workers. Queen attendants The attendants groom and feed the queen. They also collect QMP (Queen Mandibular Pheromone) from the queen and share it with the bees around them who also share it spreading its effects through the hive. Honeycomb building Workers will take wax from wax producing workers and build the comb with it. Pollen packing Pollen brought into the hive for feeding the brood is also stored. It must be packed firmly into comb cells and mixed with a small amount of honey so that it will not spoil. Unlike honey, which does not support bacterial life, stored pollen will become rancid without proper care. It has to be kept in honey cells. Propolizing The walls of the hive are covered with a thin coating of propolis, a resinous substance obtained from plants. In combination with enzymes added by the worker this has antibacterial and antifungal properties. Propolis is used to aide with ventilation and at the entrances of hives. Mortuary bees Dead bees and failed larvae must be removed from the hive to prevent disease and allow cells to be reused. They will be carried some distance from the hive by mortuary bees. Guard Bees (Days 18 – 21) protect the entrance of the hive from enemies Soldiers hang around near the entrance and attack invaders. They work in concert with entrance guards. Entrance guard bees inspect incoming bees to ensure that they are bringing in food and have the correct hive odor. Other bees will be rejected or attacked with soldier bees. Outside guard bees may take short flights around the outside of the hive in response to disturbances. Fanning bees Worker bees fan the hive, cooling it with evaporated water brought by water carriers. They direct airflow into the hive or out of the hive depending on need. Water carriers When the hive is in danger of overheating, these bees will obtain water, usually from within a short distance from the hive and bring it back to spread on the backs of fanning bees. The worker bee has a crop separate from the nectar crop for this purpose. Foraging bees (Days 22 – 42) The forager and scout bees travel (up to 1.5 miles) to a nectar source, pollen source or to collect propolis. Cell Cleaning (Day 1-2) Brood cells must be cleaned before the next use – cells will be inspected by the queen and if unsatisfactory will not be used. Worker bees in the cleaning phase will perform this cleaning. If the cells are not clean, the worker bee must do it again. Nurse bee (Day 3-11) Nurse bees feed the worker larvae worker jelly which is secreted from glands that produce royal jelly. Advanced Nurse Bees (Day 6-11) Feed royal jelly to the queen larva and drones receive worker jelly for 1 to 3 days at which time they are started on a diet of honey and pollen. Wax production (Day 12-17) Wax Bees – build cells from wax, repair old cells, and store nectar and pollen brought in by other workers. Early in the worker’s career she will exude wax from the space between several of her abdominal segments. Four sets of wax glands, situated inside the last four ventral segments of the abdomen, produce wax for comb construction. Worker activities Honey sealing (Day18 – 22 ) Mature honey, sufficiently dried, is sealed tightly with wax to prevent absorption of moisture from the air by workers deputized to do same. Drone feeding Drones do not feed themselves; they are fed by workers. Queen attendants The attendants groom and feed the queen. They also collect QMP (Queen Mandibular Pheromone) from the queen and share it with the bees around them who also share it spreading its effects through the hive. Honeycomb building Workers will take wax from wax producing workers and build the comb with it. Pollen packing Pollen brought into the hive for feeding the brood is also stored. It must be packed firmly into comb cells and mixed with a small amount of honey so that it will not spoil. Unlike honey, which does not support bacterial life, stored pollen will become rancid without proper care. It has to be kept in honey cells. Propolizing The walls of the hive are covered with a thin coating of propolis, a resinous substance obtained from plants. In combination with enzymes added by the worker this has antibacterial and antifungal properties. Propolis is used to aide with ventilation and at the entrances of hives. Mortuary bees Dead bees and failed larvae must be removed from the hive to prevent disease and allow cells to be reused. They will be carried some distance from the hive by mortuary bees. Guard Bees (Days 18 – 21) protect the entrance of the hive from enemies Soldiers hang around near the entrance and attack invaders. They work in concert with entrance guards. Entrance guard bees inspect incoming bees to ensure that they are bringing in food and have the correct hive odor. Other bees will be rejected or attacked with soldier bees. Outside guard bees may take short flights around the outside of the hive in response to disturbances. Fanning bees Worker bees fan the hive, cooling it with evaporated water brought by water carriers. They direct airflow into the hive or out of the hive depending on need. Water carriers When the hive is in danger of overheating, these bees will obtain water, usually from within a short distance from the hive and bring it back to spread on the backs of fanning bees. The worker bee has a crop separate from the nectar crop for this purpose. Foraging bees (Days 22 – 42) The forager and scout bees travel (up to 1.5 miles) to a nectar source, pollen source or to collect propolis. A colony of honeybees in early summer consists of a queen, thousands of workers and a few hundred drones living together as a community upon double-sided combs containing brood and stores of honey and pollen. The queen alone lays the eggs from which the other members of the colony develop, the workers from fertilized eggs and the drones from unfertilized eggs laid in slightly larger cells. The combs are made of wax secreted by the workers. In colonies living ‘wild’ in hollow trees or in cavities in walls the workers construct the combs unaided, but in modern moveable-comb hives the beekeeper provides thin, flat sheets of beeswax, embossed with a regular hexagonal pattern and enclosed by hanging wooden frames, for the bees to use as a foundation upon which to build the rows of cells on either side. The fertilized eggs laid by the queen in worker cells take three days to hatch. The tiny grubs, or larvae, are fed by nurse bees and grow rapidly to reach their full size five days later. Their cells are then sealed over with porous cappings of wax and the larvae turn into pupae from which the young workers emerge in another 12 -14 days, when they chew their way through the cappings to join the older workers on -the combs. Drones take a few days longer to develop. By midsummer the colony will have reached its greatest strength, with up to fifty thousand or more bees if all goes well. Thereafter, the population of workers will decline, and by early autumn all the drones will have died, leaving the queen and a reduced number of workers to survive the winter. Breeding starts again early in the year, (January or February) , slowly at first, but with gradually increasing numbers of young workers emerging to replace the old, over-wintered bees until the peak of egg-laying by the queen is reached about four months later. The cycle of colony growth and decline might, however, be interrupted by the issue of a swarm, usually sometime in May, June or July. The causes of swarming are not fully understood, though it is known that overcrowding of the hive is one of the predisposing factors. Whatever the cause, the effect is that a large proportion of the workers, together with the queen, pours out of the hive during the heat of a fine day and flies around before settling in a tight cluster on a nearby bush or other convenient support. If the swarm is not taken by the beekeeper, the bees and the queen will eventually fly off to establish a new colony in a new home, discovered for them by scout bees, usually some distance away from the hive from which they issued. The rest of the bees will remain behind in the hive, with the brood. On the brood combs will be some queen cells large, acorn-shaped cells which hang mouth downwards and contain larvae hatched from normal fertilized eggs but fed on a special diet of ‘royal jelly’ produced by die nurse bees. In these cells queens will develop, one of which, after mating in the air with several drones in succession, will become the new laying queen of the swarm’s ‘parent / original’ colony. The issue of a swarm brings about a sudden depopulation of the hive, and a consequent decrease in the foraging capacity of the colony, at a time of year when nectar is likely to be readily available. It is, therefore, important for the beekeeper to take steps to avoid his bees to swarm, by using methods to be discussed later, if he in the maximum amount of honey possible. The Queen Bee is the most important Bee in the colony. She has a larger body which allows her to lay over 2,000 eggs a day. Her main job is to lay the eggs from which all the other Bees of the hive develop. The Queen is different from the workers. She never collects food and depends on the workers to feed & groom her. 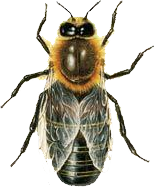 In each Bee colony or hive there is one Queen Bee – the Queen Bee is the mother of the colony. She lays all of the eggs which develop into worker Bees and drones or new Queens. There are two types of female in a Bee colony – the worker Bees and the Queen Bee. Both types start out as fertilized eggs – the difference in their diet and the cell that the egg is laid in are the factors that determine whether they will emerge as a Queen or a worker. In ordinary circumstances the Quuen Bee is the only reproductive female in the colony. 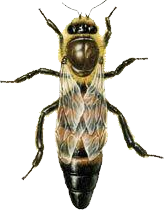 A Queen Bee can be identified because she is larger than the worker Bees, roughly twice their size. She is longer in the body than the worker Bees with a smaller head. When a new Queen emerges from her cell she is a virgin. About 10 to 20 days after the Queen has emerged from the Queen cell she will leave the hive on a mating flight. Her mating flight and when she swarms are the only times she will leave the hive. For the rest of her life she will live in the brood frames at the bottom of the hives and lay eggs. As she moves around the frame the worker Bees will turn towards her – this is called a retinue. The retinue is ever changing – the workers in the retinue will groom and feed the Queen. When grooming the Queen the workers will obtains substances from her called pheromones and these substances control some of the behaviour in the colony. The temprament of the Bees in the colony will rely largley on the Queen as she is mother to all of the colony. It can be noted that within a few months of changing a Queen the temprament of the colony can change entirley. The size of the colony is also depandant on the Queen – if she is a good strong Queen, and lays the correct eggs in the appropriate cells then the colong will be large in number, strong and healthy. She is the other Female , but the smallest bee in the colony – only about half the size of the drone or the Queen. The worker Bee is produced from a fertilised egg – unlike her brother the drone who is produced from an unfertilised egg. The honey Bee egg will hatch in about three days and emerge as a small white larva. At this stage one of the worker Bees who is acting as a nurse will fill the cell in which the larva is resting with a substance called Bee milk. On the eighth day the cell will be capped with wax. The worker Bee will emerge from her cell 21 days later. She is then ready to her duties in the hive. In the summer time a worker Bee will live for just over a month – about 36 days. During the winter she will live for about 6 months. When the worker Bee emerges from her cell she still has a little more maturing to do – during these few days she will be doing cleaning duties around the hive. After a few days she will take her first flight around the hive. There are various roles within the colony that the worker Bee will perform – usually they will all progress from one role to the next but are able to perform any job at any time. The roles include nursing & cleaning, as mentioned earlier, also wax production, honey processing and guard duties. These roles are all ‘in-door’ duties and after about 20 days she will become a forager. When the worker Bee is in this stage of her life her role is to find and collect pollen, nectar, water and propolis. These substances are required by the hive to live. 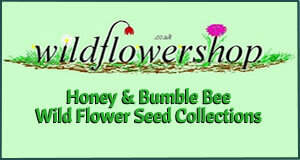 The pollen is used by the Bees as a source of protein and vitamins. It is collected from flowers and carried back to the hive on the Bees hind legs. Nectar is stored in the honey comb, transported back to the hive is a specially designed honey stomach. Nectar, gathered from flowers is primarily sugar and water. Polpolis is a sticky substance gathered from plant buds, again carried to the hive on the Bees legs and is used for maintaining the hive. A small number of the foragers will become what are known as scouts. The scouts explore the area around the hive for the best flowers from which to gather nectar. When they find a particular flower with a high sugar content they will return to the hive and ‘dance’ for the other Bees. The dance is a way of communicating to the other Bees the best forage available and the direction to go in order to find it. A worker Bee has a life span of about 36 days. When a colony is at full strength in the peak summer months there may be as many as 50 – 60 thousand adult Bees and approaching 40 thousand Bees developing in the brood frames. A Worker bee is any female eusocial bee that lacks the full reproductive capacity of the colony’s queen bee; under most circumstances, this is correlated to an increase in certain non-reproductive activities relative to a queen, as well. Worker bees occur in many bee species other than honey bees, but this is by far the most familiar colloquial use of the term. Honey bee workers keep the hive temperature uniform in the critical brood area (where new bees are raised). Workers gather pollen into the pollen baskets on their back legs, to carry back to the hive where it is used as food for the developing brood. Pollen carried on their bodies may be carried to another flower where a small portion can rub off onto the pistil, resulting in cross pollination. Almost all of civilization’s food supply (maize is a noteworthy exception) depends greatly on crop pollination by honey bees, whether directly eaten or used as forage crops for animals that produce milk and meat. Nectar is sucked up through the proboscis, mixed with enzymes in the stomach, and carried back to the hive, where it is stored in wax cells and evaporated into honey. Workers must maintain the hive’s brood chamber at 34.4 degrees C to incubate the eggs. If it is too hot, they collect water and deposit it around the hive, then fan air through with their wings causing cooling by evaporation. If it is too cold, they cluster together to generate body heat. The life of all honey bees starts as an egg, which is laid by the queen in the bottom of a wax cell in the brood area of a hive. A worker egg hatches after three days into a larva. Nurse bees feed it royal jelly at first, then pollen and honey for six days. It then becomes an inactive pupa. Honeycombs have hexagonal cells on both sides of a vertical central wall. As shown in the photo, these cells are inclined upward, primarily to retain liquid nectar and honey. During its 14 days as a pupa, sealed in a capped cell, it grows into a worker (female) bee, emerging on the 20th day. In most species of honey bees, workers do everything but lay eggs and mate, though Cape honey bee workers can lay eggs. They build the comb from wax extruded from glands under their abdomen. They clean, defend, and repair the hive. They feed the larva, the queen, and the drones. They gather nectar, pollen, water, and propolis. They ventilate, cool and heat the hive. 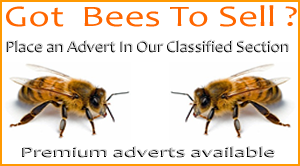 The Male Bees are called drones, they are found in much smaller numbers than the worker Bees. The drones develop from an unfertilised egg and are layed in a drone cell. The drones are bigger than the worker Bees and can be spotted by several distinguishing features – including the size and shape of their eyes and the size of their wings. The drone has the shortest life span, on average living for just 22 days after emerging from his cell. The only know role of the drone is to mate with the Queen. The drones will gather outside the hive in a flying cluster, they are attracted by the pheromones that the Queen produces when she emerges from the hive on a mating flight. The act of mating with the Queen is fatal for the drone – as his genitalia becomes detached from his body during mating. At the end of the summer the worker Bees will evict any drones who remain in the colony. The drone bee. How do I best explain the brief life of the honey bee male? Spend their time drinking nectar, mating (in the air at that! ), and lazing around on flowers. They do little around the home (a hive or, if a feral bee – perhaps a hollow tree or cavity in an old building somewhere). They help themselves to nectar stores, yet they don’t do much to help out with the kids (okay, okay, I’m humanising them a bit – the brood). Heck, they don’t even go out and get food for the family!But…. Their lives are very brief (- is that unfortunate?). They are only reared when it suits the queen honey bee (- is that exploitation?). They die straight after mating! (- is it worth the sacrifice?). Not all of them even get to mate! (- is that fair?). At the end of the summer, or when the going gets tough, they’re the first to be kicked out of the colony, so as not to drain resources (- is that disrespectful?). “Well, if my life was short like that, I’d want to enjoy it while I could!”. Drones have short lives, but they are there when the colony needs them, to make the ultimate, heroic sacrifice of mating (then promptly dying), all in order to ensure the continuity of the whole colony. OR, you could simply say: it’s just nature – which of course, is what it is – it’s the natural way of things for honey bees. Okay, enough flippancy. Let’s get on with the real information! Drones are larger than workers, but smaller than queen honey bees. Their eyes are relatively large, and they develop from unfertilized eggs. (The process of fertilization being controlled by the queen honey bee). Interestingly, the drone has no father, but he does have a grandfather! Being from an unfertilised egg, he has only half the chromosomes of a worker bee, however, the queen came from a fertilized egg. Put another way, the queen who layed the drone eggs, is the offspring of an egg fertilized by a drone (male). Drones themselves, however, are the offspring of eggs that have not been fertilized by a male! This scenario is referred to by biologists as ‘parthenogenesis’. Each colony will produce several hundred drones. Their main contribution to the colony is the act of mating. Mating tactics of drone bees reminds me of blokes congregating at a club, waiting for the women to arrive! In a similar fashion, drones congregate around ‘hot spots’ waiting for the appearance of new queens. During the course of around 3 nuptial flights the queen honey bee may mate with around 20 drones. Obviously some of the drones will be disappointed then! As explained before, the drone will die upon mating. This happens because the drone’s reproductive organs are torn away from its body, whilst the queen flies off, with the drones genitalia attached to her. Drones may live for just a few short weeks, but if they are lucky, they may live up to 4 months. They are thrown out of their colonies by the end of summer, but in any case, by the end of autumn, there will be few or no drone bees around. Unlike queens and workers, the drone cannot sting. And although the do not forage for food, it is believed by some that they may help to incubate the brood. In ensuring future generations of honey bees, it sounds like they do a great deal for the colony in a very short space of time!